The next entry in the Fallout series isn’t coming anytime soon, but if you still haven’t had enough of its post-apocalyptic world, you may want to keep an eye on an upcoming Fallout 4 mod called Fallout Miami. Fallout Miami will give players a look at a post-apocalyptic Florida which will still look desolate despite the change of scenery. The mod will also come with new weapons and enemies, making it feel like a complete Fallout experience. The team also revealed recently some new details on the map. Let’s take a step back for a moment. A lot of you have been wondering where exactly Fallout: Miami takes place and what the ingame map will include. We’re going to answer that question today. 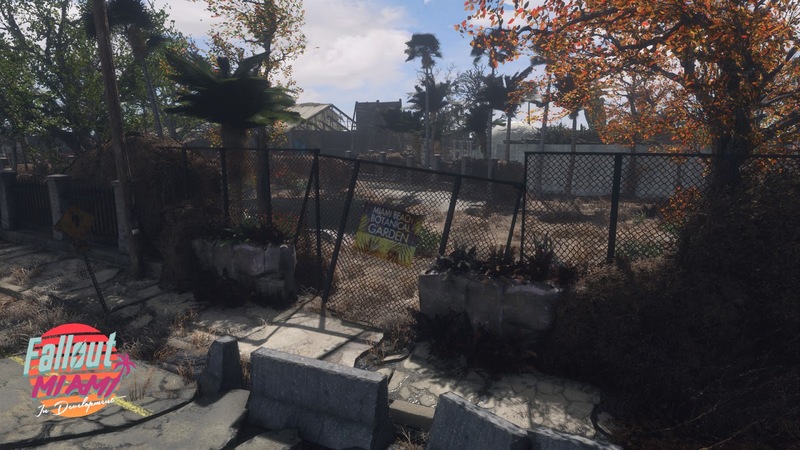 Here are the borders of the Fallout: Miami game world, a loving recreation of a lovely part of southern Miami Beach. In order to fit all of the interesting locations we have planned, we’ve taken a few creative liberties, but our map remains mostly accurate to the real world area we want to represent. Meridian: On the outskirts you’ll find Meridian, an industrial zone that hosts the well-known Pop & Chill bottling plant, among other factories, and the homes of Miami’s working class. Atlantic: Just over the river is Atlantic, a district of two parts. Along the coast are some of the most opulent resort hotels, including the world-famous Sunshine Hotel & Casino, while the central area is mostly residential. Maimon: Home to the university campus and hospital. Bayshore: Luxury housing and luxury leisure, mansions are a common sight in Bayshore and the Cuban golf course is an ever popular destination for fat cats both native and visiting. Sheridan: Similarly to Atlantic, the coastline is dedicated to tourism. On the west side of the river are many suburb-like neighbourhoods, as well as Miami Beach Sheridan High School, which borders Bayshore’s vast golf course. Downtown: The beating heart of Miami. Business, shopping, bars, restaurants, theaters, Downtown has it all, including civic buildings such as City Hall and the Miami Beach Convention Center. Flamingo: A patchwork of retirement communities, entertainment and luxury, Flamingo is Miami, just calmer. Locations range from Miami’s largest yacht club to the Flamingo Trailer Park. Fallout Miami releases on a yet to be determined date. More information can be found on the mod’s Official Website.